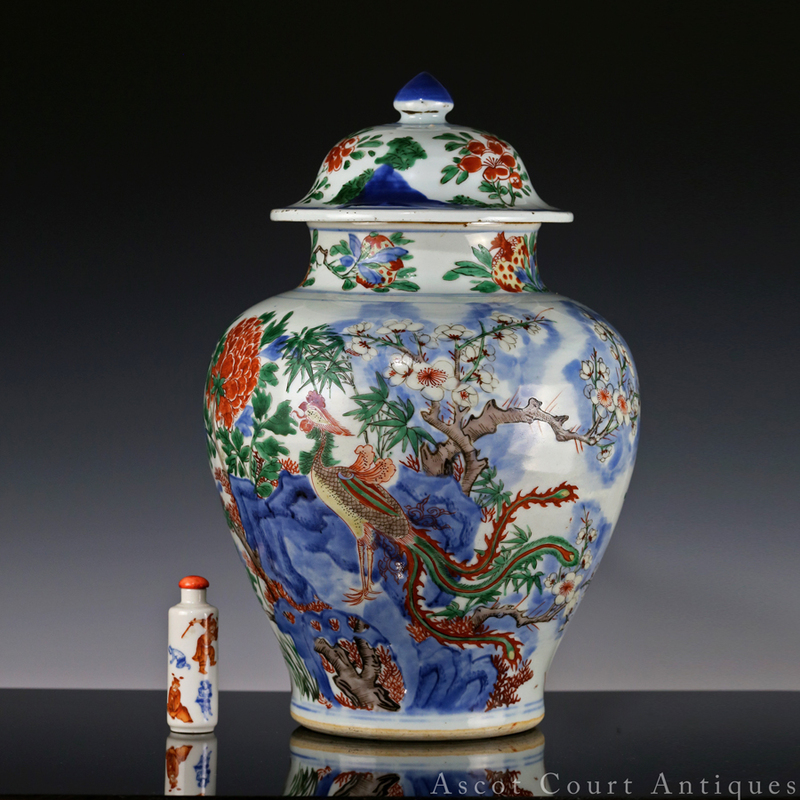 A gorgeous and richly decorated transitional wucai baluster jar and cover, crafted during the mid-17th century Shunzhi reign, with a neck framed by auspicious peach and pomegranate sprigs, and a body profusely painted with a phoenix perched on top taihu rockwork laden with peonies, prunus blossoms, and bamboo. 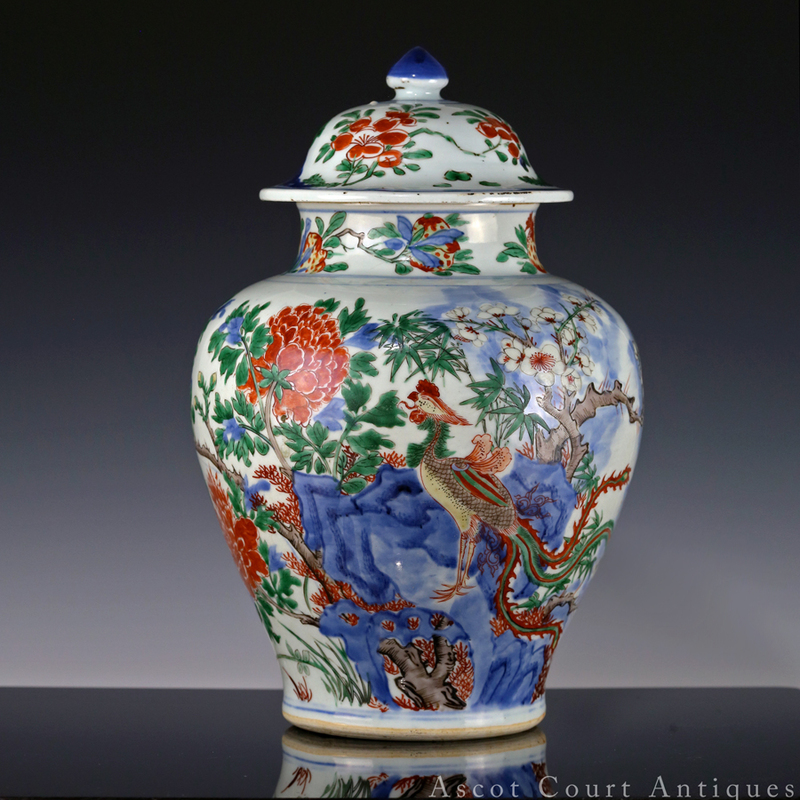 A superior example of transitional period wucai pieces featuring bird-and-flower painting, this jar is drawn with naturalism and feeling, vibrant enamels, and is coated with a clear, bright glaze. Although the Chongzhen and Shunzhi reigns are often grouped together as the Ming-Qing transitional period by scholars and collectors alike, distinctions can be made for Shunzhi porcelain as a short but unique period in the history of Chinese ceramics. After the last Ming emperor hung himself in 1644, all of China became a proving ground for Manchu military might as the conquerors moved steadily south. In 1645, Jingdezhen was captured and Nanchang, the nearest provincial capital, became a Manchu military headquarters. Although Ming resistance briefly reclaimed the area in 1648, by 1649 Jiangxi was firmly back in Manchu hands. War and unrest disrupted what had been a thriving local economy in the late 16th century; government registers recorded a major decline in population, and the chenqiang walls around the township were in such a state of disrepair that tigers were reported to have appeared in town. Despite the vortex of changes that upturned the lives of the emperor down to the peasant, Jingdezhen potters carried on. 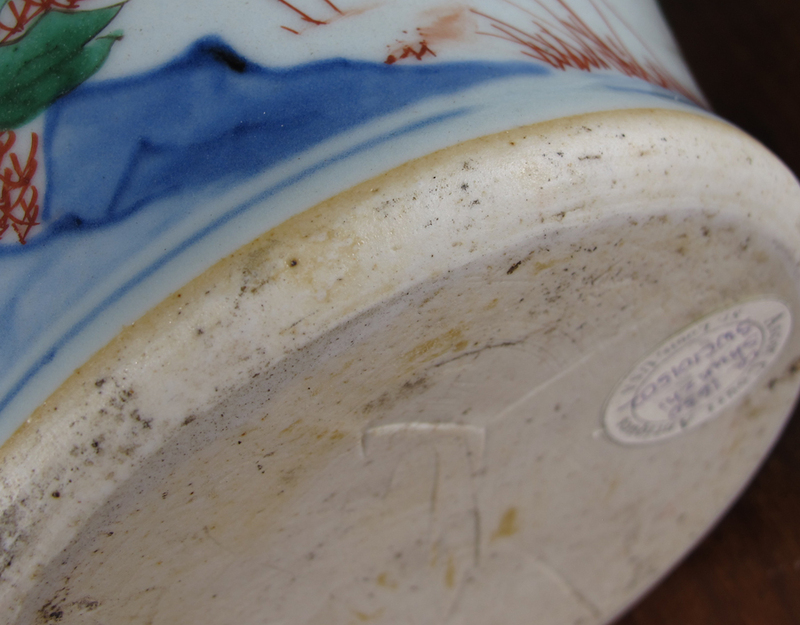 War had either eliminated or reduced large swathes of Jingdezhen’s usual customer base: the imperial court, the Ming scholar-gentry, and the overseas export markets. In response, potters reformulated their wares to appeal to those in the middle and merchant classes that could still afford them. Departing from the intellectual refinement and austere minimalism of the earlier Tianqi reign, Shunzhi wares are bold and strikingly decorated. Brushwork is generally stronger than the soft roundness of Chongzhen wares. In the haze of disaster and uncertainty, motifs turned towards uncomplicated and popular wishes for abundance, good fortune, and longevity. On this particular jar, the pomegranates (shiliu duozi) symbolize the destiny to have many sons, the peaches longevity, and the peonies riches and wealth. But most importantly, a phoenix was painted to represent the coming of a new era. 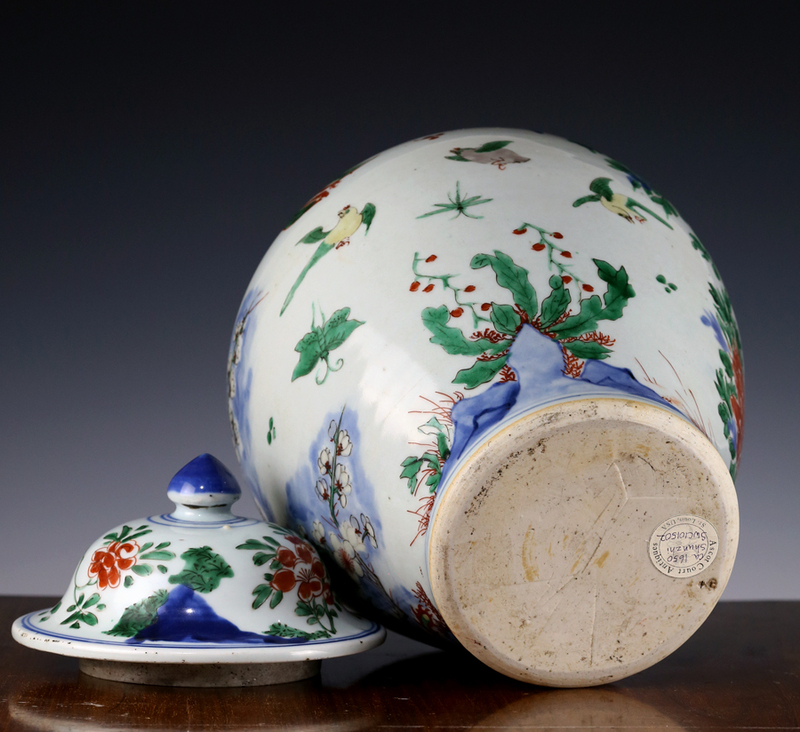 Larger shapes such as charger plates and covered jars became more in vogue during the Shunzhi era. This particular jar’s shape, with its broad shoulder and unglazed base, is unique to the Shunzhi period. 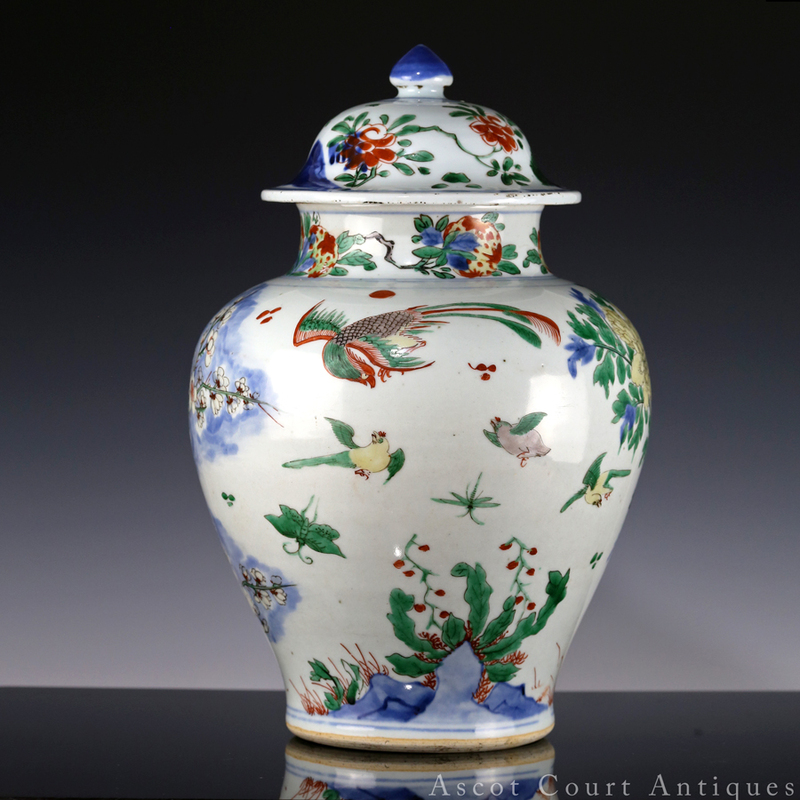 In the Kangxi period jars would gain a foot rim and a glazed base. 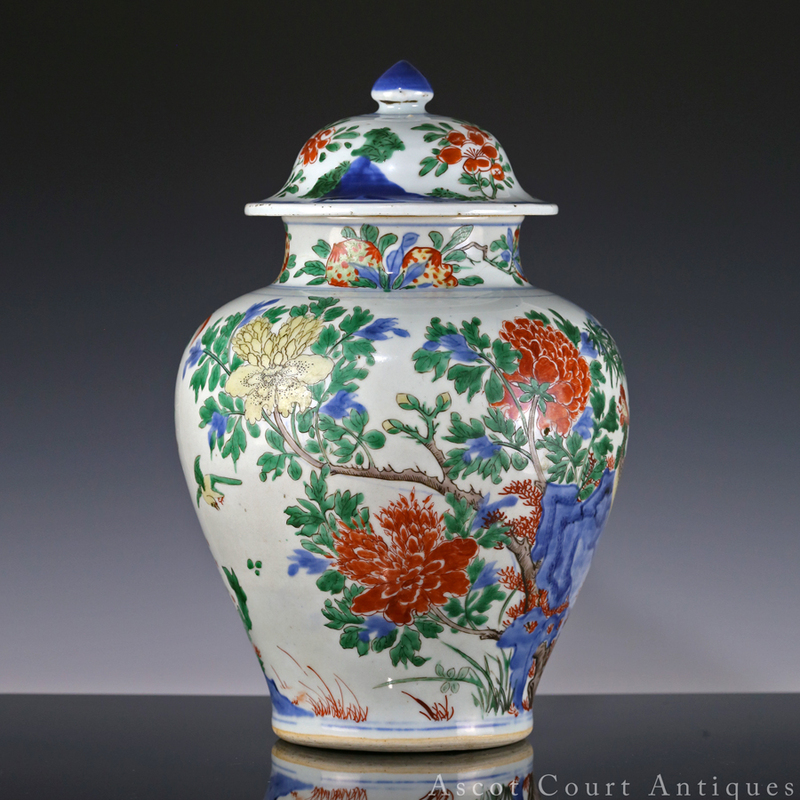 The Shunzhi period is also notable as a time when qinghua wucai (that is, enameled pieces with underglaze cobalt decoration) came back in fashion. This type of wucai decoration, while popular during the Wanli period, became more rare in the Tianqi and Chongzhen reigns. This decorating technique was challenging to execute in that potters need to first fire the underglaze blue portions of the design, before enameling the piece and firing it a second time. 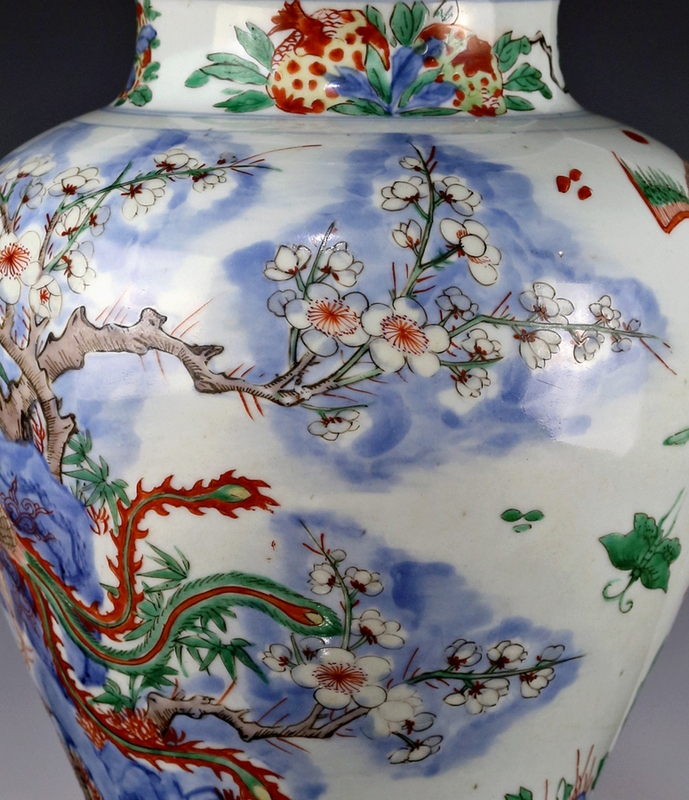 This technique would largely disappear after potters formulated a blue overglaze enamel during the late Kangxi period. 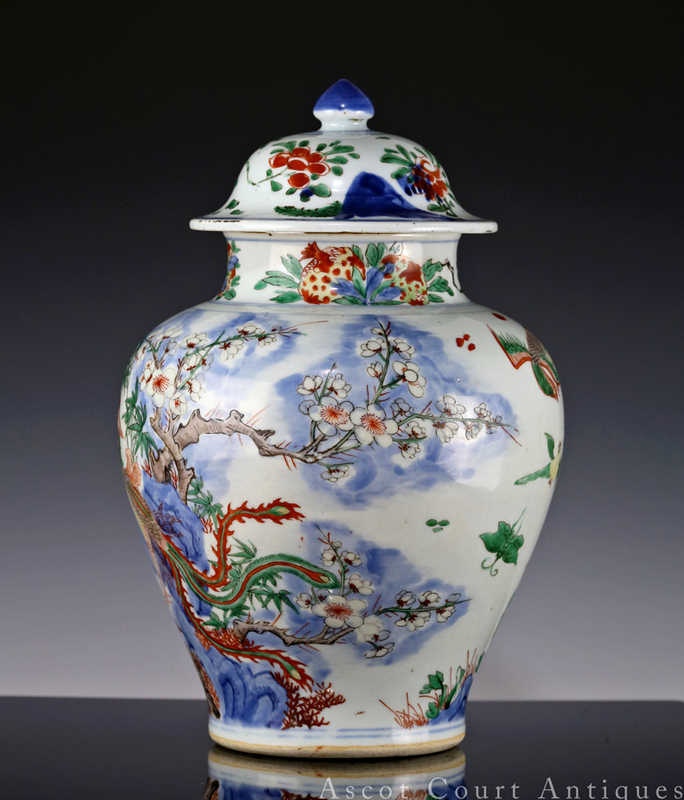 For a comparable jar, see Metropolitian Museum of Art 24.80.164, on view in gallery 203. A gu beaker vase with a similar design is in the Shanghai museum (see p. 168-169 of Seventeenth Century Jingdezhen Porcelain from the Shanghai Museum and the Butler Collections). 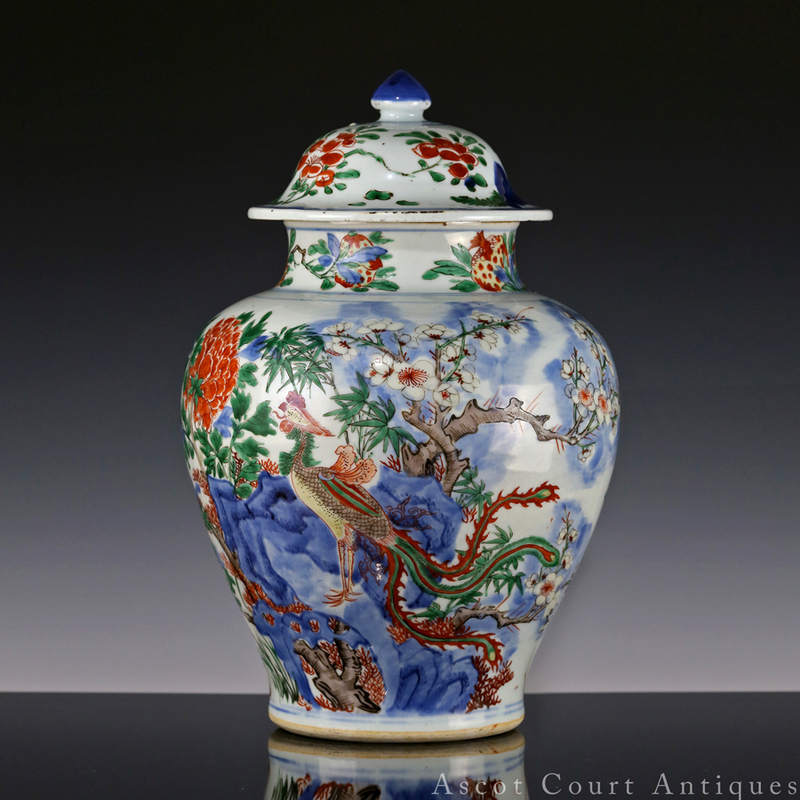 A wucai beaker vase with a peacock by prunus drawn against a blue reserve was auctioned by Christie’s in March, 2015 (sale 25284 lot 3538). 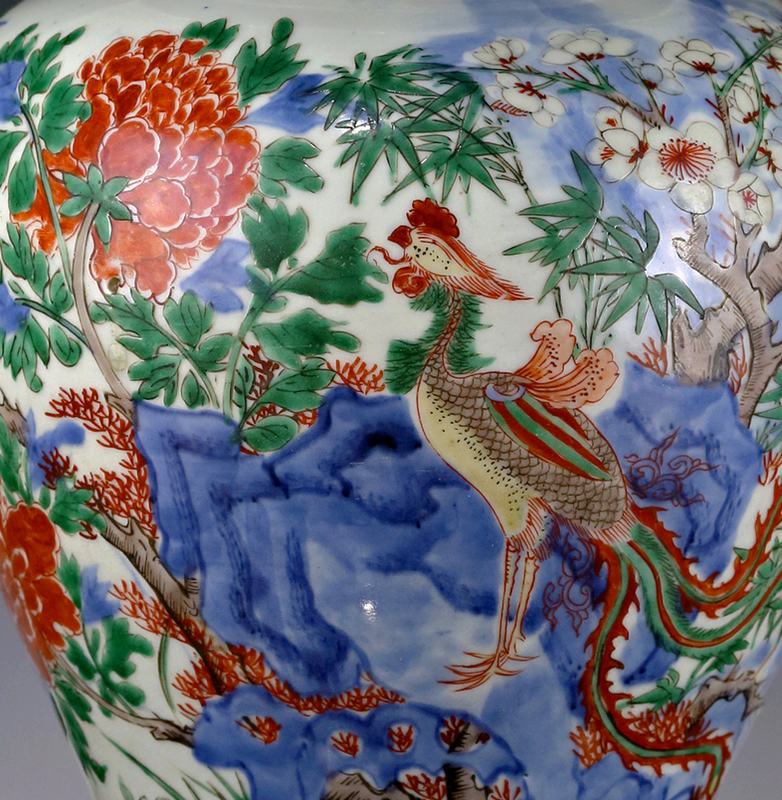 From the same sale, there was a Shunzhi brush pot featuring pheasants perched on rockwork (sale 25284 lot 3542).